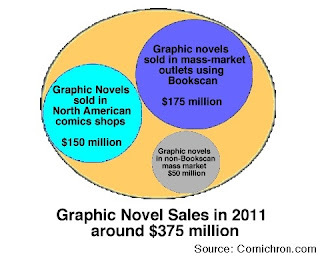 As in past years, Brian Hibbs has gotten access to the actual sales for trade paperbacks and graphic novels in 2011 as recorded by Bookscan, a service of Nielsen. I encourage readers to take a look at Hibbs's article and see how the figures break down. Bookscan draws upon cash-register data from many member bookstores — and from Amazon — and its share of industry sales on individual titles varies. The service reportedly covers something like 70% of bookstore sales, but that varies depending on the item. Thanks to Amazon offering Bookscan figures to creators, we're able to compare them with known sales to get a sense of what's in and what's out; from what I've seen, that 70% is a reasonable estimate, but I don't have enough data to draw from to say for sure. So the list comprises a big chunk of bookstore sales. Does it cover all items? Pretty much, yes, with reports for more than 24,000 items going all the way down to single copies. My own spot-check found a few significant titles that should have been in the file but weren't, but I do not have a big enough sample to say how comprehensive the list is. For discussion purposes, figure that the list gives us maybe three-quarters of all sales outside comics shops for graphic novels and manga. So how'd they do? Hibbs finds that the top 750 items, once non-comics items are weeded out, sold for $79,961,951 at full retail; that's down 8.5% from last year, just in that grouping. On the other hand, the list of items in the "long tail" grew again, and it adds about $95 million to the overall total; that brings the overall amount to $175 million. Armed with that, as in past years, I have calculated an "all-industry number. Here's how it works. We start with the two figures we already know about 2011. The Top 300 trade paperbacks for every month in 2011 had sales of $70 million in comics shops — and sales for all trades in the Direct Market were probably closer to $150 million. We also already know that the Top 300 Comics each month accounted for $248 million of Diamond's $417 million in sales; periodicals not in the Top 300 and magazines would have accounted for the remaining $20 million or so. Now we go to the mass market. 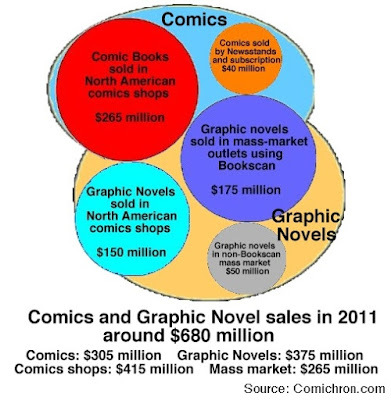 Taking Hibbs' figures, we have around $175 million in Bookscan outlets for graphic novels. That may be high, depending on how much of the long tail of that table still has non-comics items in it; but let's take it as is. If Bookscan is three-quarters of the market or so, that could mean there's another $50 million or so in graphic novel sales outside Bookscan. So all told, that's about $225 million in graphic novels and trade paperbacks outside the comics shops — and $375 million in trades altogether. This means that trades are pulling in more money than comic books, right? Yes, but there's some outlets for comic books we have yet to add. Comics are still sold through newsstands, although the percentage is falling; looking at Marvel and Archie's Statements of Ownership, I would guess there could be $30-35 million in newsstand sales not covered in the Diamond charts. And finally — and almost always forgotten — are subscription sales, which could bring in another $3-5 million. 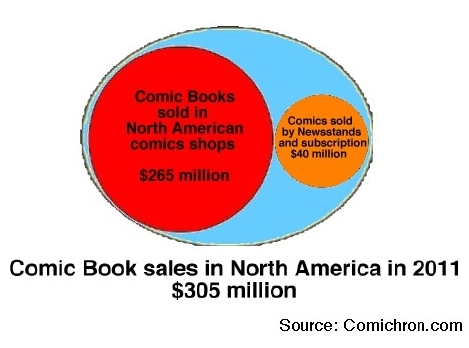 Between those sales and the sales inside comics shops, periodicals would be doing something near to $305 million. 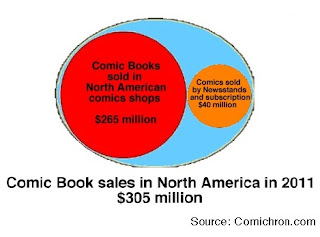 Comic books are still king in comics shops, where they're nearly 60% of the trade — but they are closer to 45% of all comics and graphic novel dollars, if Hibbs' Bookscan estimates are correct. And that's where you get the largest figure that's on the Yearly Sales table here. 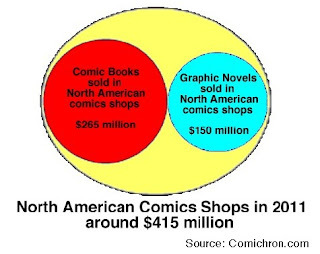 The Direct Market is 60% of the overall market for comics, and nearly twice the size of the bookstore market when it comes to comics material. Note, it does not include two important groupings. Diamond UK sells about 10% again its U.S. direct market sales of comics and graphic novels to comics shops in the United Kingdom — so that's another $40 million or so that publishers here realize. This may or may not expand out to the UK bookstore market the same way, given rights issues, but if it did, the United Kingdom could add $60 million or more to the U.S. total, meaning U.S. print products are bringing in three quarters of a billion dollars annually. And that doesn't get into digital sales at all. The biggest question marks above have to do with the portion of the mass market outside Bookscan, first and foremost — and then the size of the newsstand market. The Direct Market figures are pretty solid, comparatively. These calculations are very rough, and subject to revision as I get more data. But the point is that the comics market is a lot bigger than what's just in comics shops — and it's larger than many probably imagine. Also add scholastic orders into schools and such, that aren't what I'd leave in the "fudge" for mass market sales. I don't have any real way to estimate those numbers, but both could be very very large numbers. About the only way to estimate them, barring internal information, would be to take royalty statements and work backwards. But, yeah, that adds to the fudge factor!